Many of us found the Knitlist when we were first exploring the internet. Started by Jill McAllister in 1994 at the University of Minnesota, this bulletin board and listserve newsletter opened a whole new world for beginning and intermediate knitters. We suddenly had access to patterns, techniques, yarns, instruction, and encouragement right on our home computers. We made our tiny blue lapel pins and found "knitting groups" posted from the List, long before the era of meet-ups. 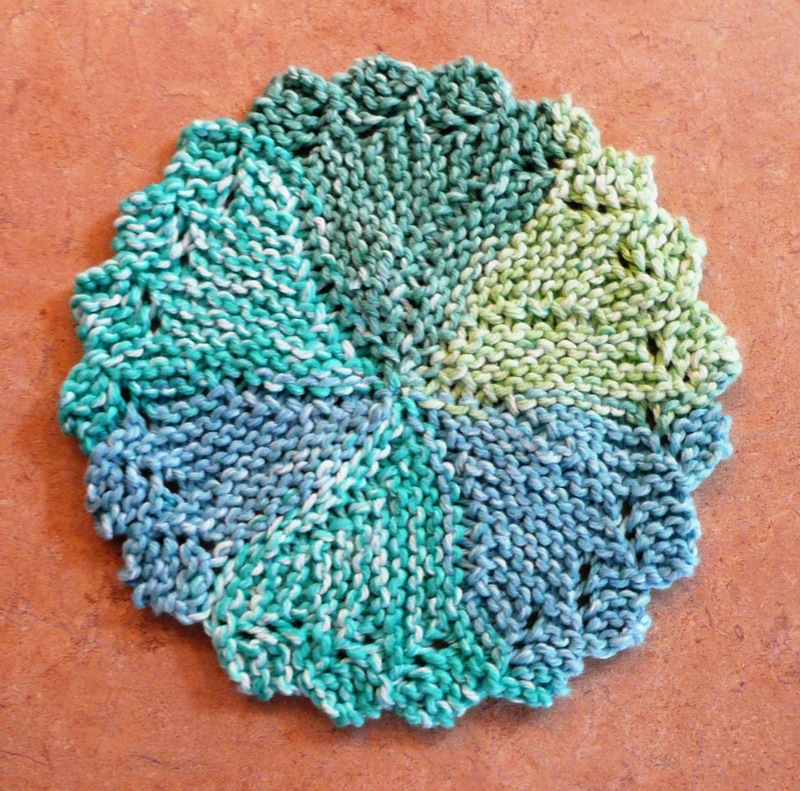 And we've been knitting these round dishrags ever since. The design has traveled the world and been made with every kind of yarn, needle size, and stitch count. It's still fun to create, lovely as a gift, and useful for dishwashing, too. Now you can knit it with just one ounce of cotton yarn. Enjoy. Yarn: 1 oz. utility cotton, 44-46yds. Gauge: approx. 16 sts = 4 in. The shaping is done with short rows: leaving sts on the left needle, turning, then continuing in the opposite direction. If this is a new technique for you, simply count the sts and watch how each section is magically shaped. Row 1: K3, yo, K11, turn. Row 3-6: Rep rows 1 & 2, twice. Row 7: BO3, K2, yo, K8, turn. Row 9: K3, yo, K8, turn. Row 10: Rep row 8. Row 11: Rep row 9. Row 13: BO3, K2, yo, K5, turn. Row 15: K3, yo, K5, turn. Row 16: Rep row 14. Row 17: Rep row 15. Row 18: Rep row 14. Row 19: BO3, K to end, including all slipped sts. Repeat rows 1-20, six times—seven sections in all. Using tail end, sew the CO row to the BO row, sew around the center sts and pull to close. Our sincere apologies for not knowing the original designer. 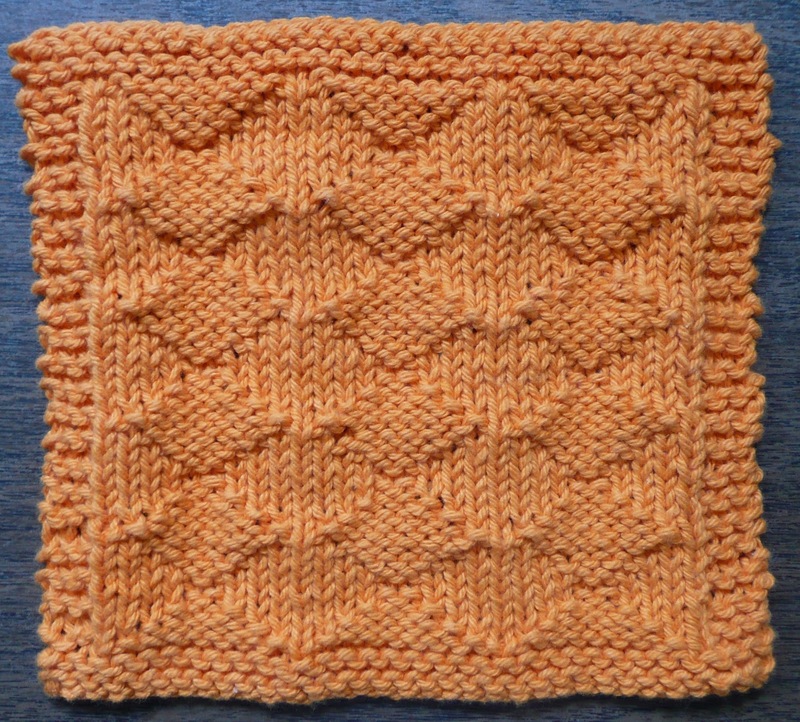 As with other dishcloth patterns, you may need to adjust your needle size to accommodate your knitting tension and still use only one ounce of yarn. As summer is ending and autumn peeking through the trees, let's sit in the sun and work on our knitting. This diagonal rib gives you lots of texture for scrubbing. It's pretty in your sink and quick to make. Size: approx. 8 x 8 in. Yarn: 1 oz. utility cotton, 44-46 yds. Gauge: approx. 16 sts. x 24 rows = 4x4 in. Row 4: Repeat Row 1. Repeat Rows 1-6, seven more times, 48 rows. Cast off all sts loosely. Weave in ends. Worked out while traveling cross country. Now it's ready for you to enjoy. Nicely set ribbing rows and garter stitch give plenty of surface texture and a classic pattern. 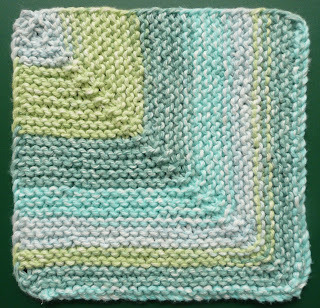 Gauge: 17sts and 24 rows = 4"
Knit across 4 rows for border. Row 1: K3, p1, k2, * p2, k2, rep from * to last 4 sts, p1, k3. Row 2: K4, p2, * k2, p2, rep from * to last 4 sts, k4. Row 3: K3, p1, k2, * p2, k2, rep from * to last 4 sts, p1, k3. Repeat rows 1-9 three times. 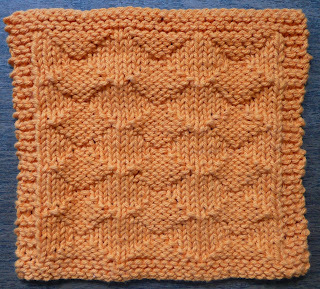 Pattern rows 37-41: Repeat rows 1-5. Bind off all 34 sts. As always, every knitter's tension is slightly different and you may need to adjust your needle size to use just one ounce of yarn. Textured pattern has a different look on the front and back. Use brightly colored yarns to show off your diamonds. Row 1 (WS): K3, *P1, K8; rep from * to last 4 sts. P1, K3. Row 2 (RS): K5, *P6, K3; rep from * to last 5 sts, K5. Row 3: K3, *P3, K4; rep from * to last 3 sts, K3. Row 4: *K7, P2; rep from * to last 7 sts, K7. Row 5: K3, P to last 3 sts, K3. Row 6: Rep Row 4. Row 7: Rep Row 3. Row 8: K5, *P6, K3; rep from * to last 2sts, K2. Rep Rows 1-8 four more times. Then knit across 4 additional rows for border. BO all 34 sts in knit. As with other dishcloth patterns, you may need to adjust your needle size to accommodate your knitting tension and still use just one ounce of yarn. Everyone's auntie made these in the 1960s, but I've reworked the pattern to make it One-Ounce Friendly. Looks great in variegated yarns or solid colors. Make one for your auntie today! Size: approx. 7.5 x 7.5 in. Gauge: approx. 16 sts x 32 rows = 4x4 in. Row 1: Sl 1 purlwise, Kfb , K1 - 4sts. Row 2: Sl 1 purlwise, Kfb, K2 - 5 sts. Row 3: Sl 1 purlwise, Kfb, K3 - 6sts. Row 4: Sl 1 purlwise, Kfb, K4 - 7sts. Cont each row in pattern as follows: sl 1 purlwise, Kfb, K to end, 32 more rows, until there are 39sts. Next row: Sl 1 purlwise, K to end. - 39sts. Row 1 (RS): Sl 1 purlwise, K2tog, K to end - 38sts. Row 2: Sl 1 purlwise, K2tog, K to end - 37sts. Cont each row in pattern: Sl 1 purlwise, K2tog, K to end, 34 more rows, until 3sts rem. Like grandma's favorite quilt block. Don't like counting stitches? Insert marker before the "K1, psso" and work to the corner. 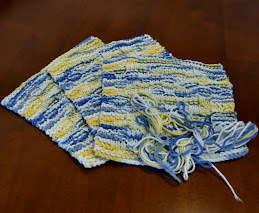 Use self-striping yarn or make it a scrap project. Gauge: approx. 16 sts x 32 rows = 4 in. Cast on 60 sts in cable cast on. Row 1 (RS): Sl 1 purlwise, K27, K2tog, K1, sl 1, psso, K28. Row 2 and all WS rows: Sl 1 as to P, K to end. Row 3: Sl 1 purlwise, K 26, K2tog, K1, sl 1, psso, K27. Cont in pattern, dec 2 sts at the center of every RS row until 3sts remain. Fasten off yarn. Weave in ends. 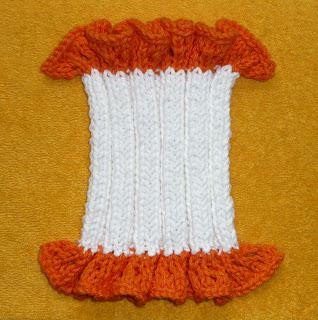 The sight of orange and white yarn in the scrap basket triggered the cool summer taste of popsicles and those dreamy orange-covered ice cream bars. Makes my mouth water. So when I started thinking of a way to combine the colors and still use only one-ounce of yarn, I had to come up with a pattern that would make you think of summer and sunshine. So ruffles it is with a solid ribbed center. Yum. 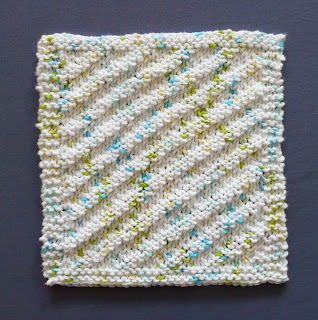 Of course you can do the pattern in one ounce of your favorite color or leftover scraps. You'll soon find these are your favorite kitchen cloths for getting glasses and jars clean. Size: approx. 7 x 7 in. Row 1 (WS): P3, * K3, P3, rep from * across. Row 2 (RS): K3, * P3, K3, rep from * across. Repeat Rows 1 & 2, twelve more times, ending RS row - 26 rows. Row 1 (WS): P3, * K3, P3; rep from * four more times. Row 2 (RS): K3, * P3, K3; rep from * four more times. Row 4: K1, yo, K1, yo, K1, * P3, K1, yo, K1, yo. K1, rep from * four more times - 45 sts. Row 5: P5, * K1, yo, K1, yo, K1, P5; rep from * four more times - 55 sts. Row 6: K2, yo, K1, yo, K2, * P5, K2, yo, K1, yo, K2; rep from * four more times - 67 sts. Row 7: P7, K2, yo, K1, yo, K2, * P7, K2, yo, K1,yo, K2; rep from * four more times - 77 sts. Cast off 77sts in knit. 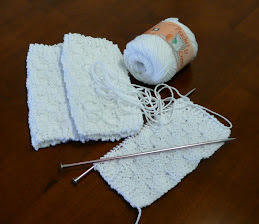 Pick up 3 sts as if purling, then pick up 3sts as if knitting, following the rib pattern across. On RS, begin Ruffle pattern Row 2 and continue through Row 7. The simple six-sided eyelet pattern makes a perfect winter design in white or do a leafy green ombre to celebrate spring's arrival. Row 1 (RS): K2, sl 1, K1, psso, yo, K1, yo, K2tog, *K3, sl 1, K1, psso, yo, K1, yo, K2tog - rep from * to last 2 sts, K2. Row 2 and all WS rows: K3, P to last 3 sts, K3. Row 3: K3, yo, sl 2, K1, p2sso, yo, * K5, yo, sl 2, K1, p2sso, yo - rep from * to last 3sts, K3. Row 5: K2, sl 1, K1 psso, yo, K1, yo, K2tog, * K3, sl 1, K1, psso, yo, K1, yo, K2tog - rep from * to last 2 sts, K2. Row 7: K6, sl 1, K1, psso, yo, K1, yo, K2tog, * K3, sl 1, K1, psso, yo, K1, yo, K2tog - rep from * to last 6 sts, K6. Row 9: K7, yo, sl 2, K1, p2sso, yo, * K5, yo, sl 2, K1, p2sso, yo - rep from * to last 7 sts, K7. Row 11: Rep Row 7. Row 12: Rep Row 2. Repeat Rows 1-12, twice more. Repeat Rows 1- 6, once more. Knit across 4 additional rows for border. Simple and sweet in red, pink tweed, or your favorite color. Size: about 8 in. x 8 in. Yarn: One ounce of 4-ply cotton yarn, approx. 42 yds. Gauge: about 16 sts x 24 rows = 4 in. Row 8: K 4, P to last 4 sts, K 4. Rows 9 & 11: Repeat Row 7. Rows 10 & 12: Repeat Row 8. Row 13: K16, P1, K16. Row 14: K4. P11, K3, P11, K4. Row 15: K15, P3, K15. Row 16: K4, P10, K5, P10, K4. Row 17: K14, P5, K14. Row 18: K4, P9, K7, P9, K4. Row 19: K13, P7, K13. Row 20: K4, P8, K9, P8, K4. Row 21: K12, P9, K12. Row 22: K4, P7, K11, P7, K4. Row 23: K11, P11, K11. Row 24: K4, P6, K13, P6, K4. Row 25: K10, P13, K10. Row 26: K4, P5. K15, P5, K4. Row 27: K9, P15, K9. Rows 28, 30, 32: K4, P4, K17, P4, K4. Rows 29, 31, 33: K8, P17, K8. Row 34: K4, P5, K7, P1, K7, P5, K4. Row 35: K10, P5, K3, P5, K10. Row 36: K4, P7, K3, P5, K3, P7, K4. Rows 37, 39, 41: K across. Rows 38, 40, 42: K4, P to last 4 sts, K 4. 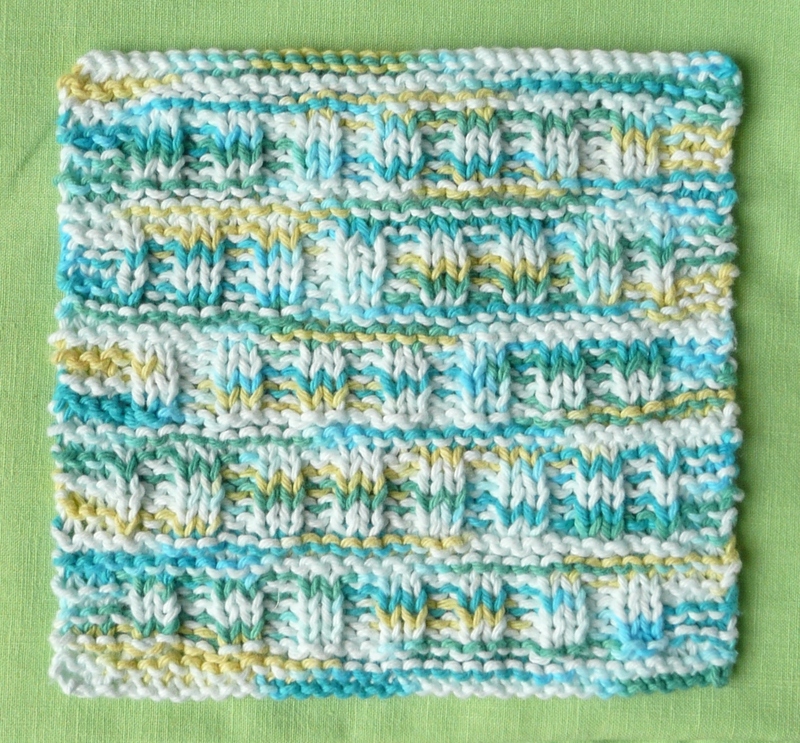 A textured, two-sided pattern made with a simple wave stitch. 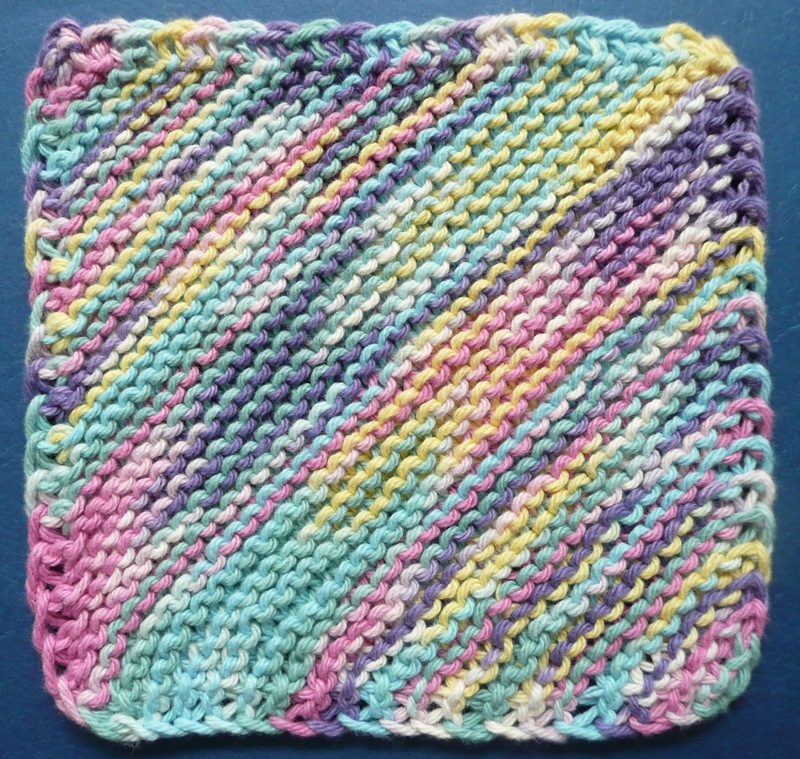 Work with one ounce of 4-ply cotton yarn on Size 6 (US) needles. Row 1: K4, yo, K4, K2tog twice, K4, yo, K1, yo, K4, K2tog twice, K4, yo, K4. Row 2: K4, P to last 4 sts, K4. Rows 4-6: Repeat Rows 1-3. Repeat Rows 1-6 six times. Work Rows 1-3 one time. Bind off evenly in K.
Yarn: 1 oz. utility/kitchen/craft cotton yarn, 4-ply, 44-46 yds. Gauge: approx. 16 sts x 24 rows = 4x4 in. Repeat Rows 1-8, four more times. Cast off all sts. Weave in ends. 1) The patterns are lovely, but require nearly 2 oz. of cotton to complete, so when you start washing dishes it's like slinging around a wet beach towel. 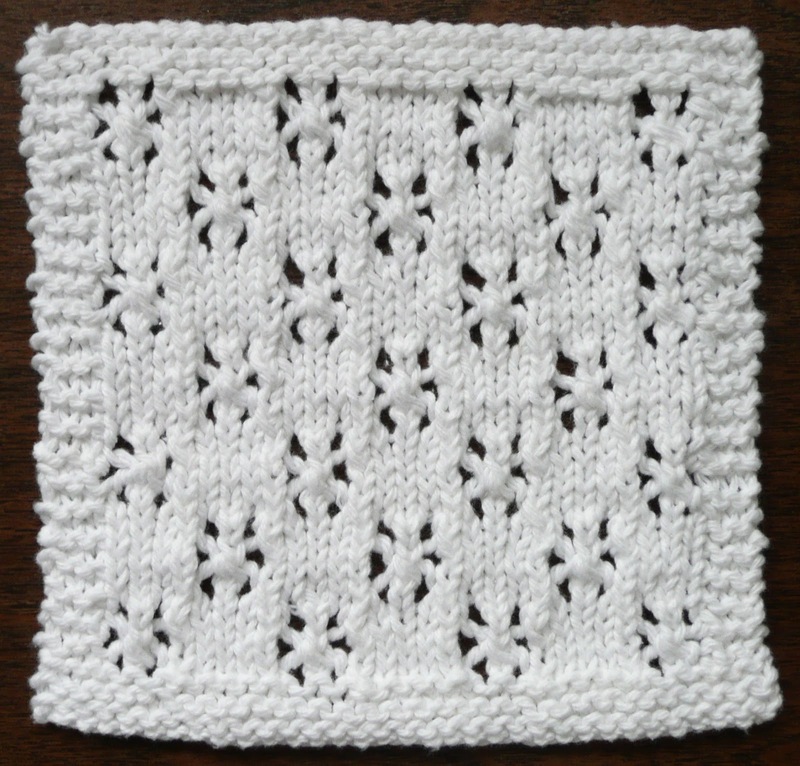 2) The patterns are lovely, but don't use a whole ball of yarn, so there are lots of leftovers you have to collect. 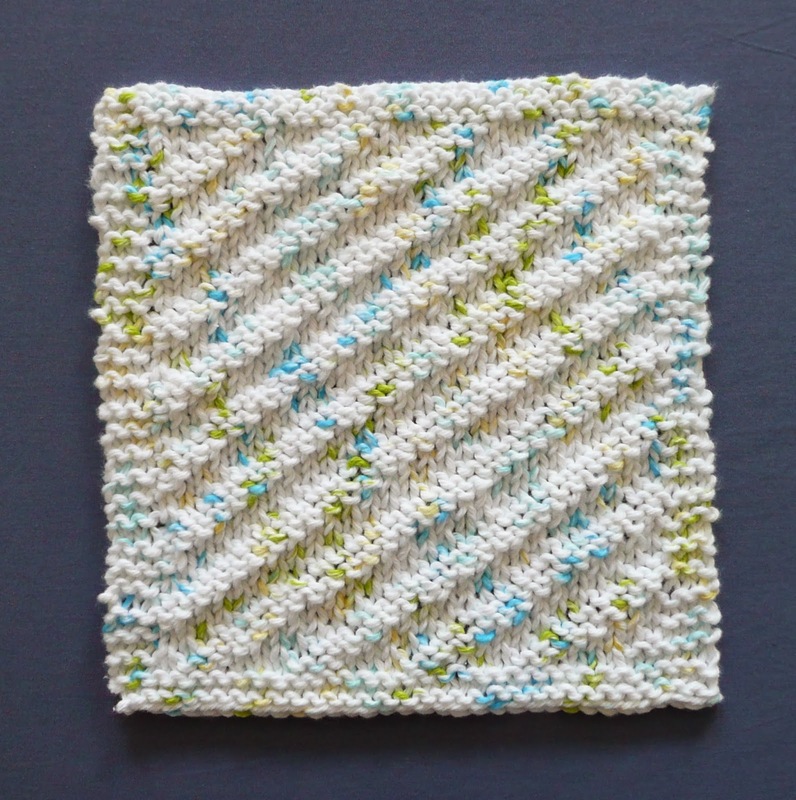 After making hundreds of dishrags, we've developed the perfect basic pattern---The BASKETWEAVE Pattern in post #1. It uses just one ounce of cotton, 44-46 yds. of yarn, any brand. The size works well for actual dishwashing and you can adapt it for different patterns. Rarely is there more than a few yards of leftover yarn. Having a problem making one ounce work well? Everyone knits differently, so go ahead and adjust your needle size to obtain the approx. gauge. The pattern on 33 sts x 50 rows is just the start---anything that will fit on those 1650 sts works. PLEASE comment your pattern or chart and we'll post them for everyone to see. Just be sure to use the basic pattern and 1 oz. of cotton yarn. No exceptions. 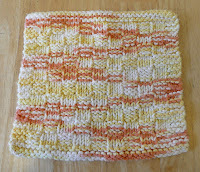 2.5 Dishrags from 2.5 oz. 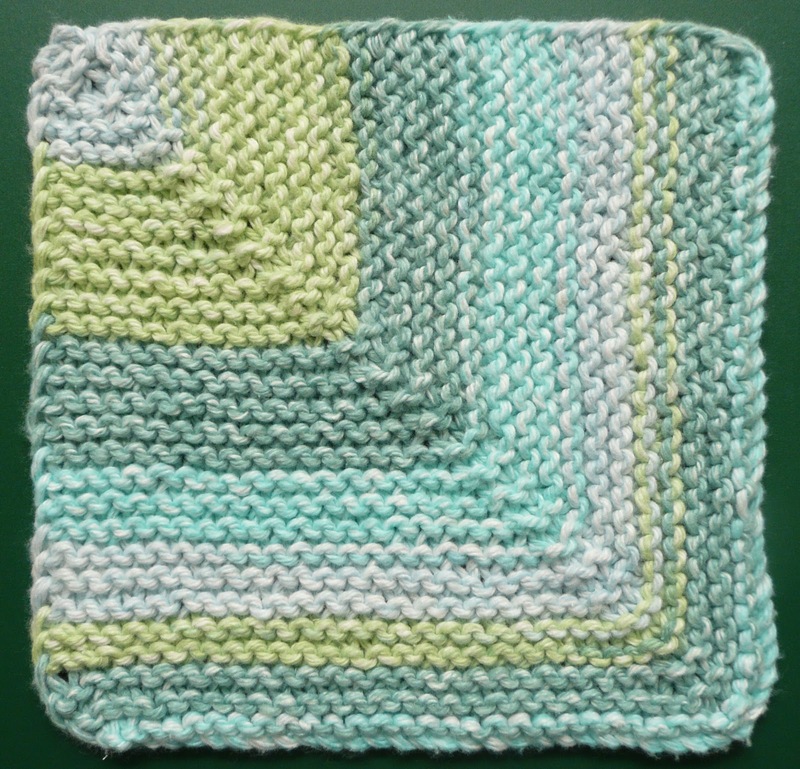 3 Dishrags from 3 oz.